Download the RNHV technical catelog in PDF. RNHV series smart medium voltage variable frequency drive (AC drive or frequency inverter), adopting power cell series con- nection technology, directly outputs 6 and 10kV voltage. It is a high voltage-high voltage VSI (Voltage Source Input) VFD. Renle regards high reliability, simplified operation and high performance as its design goal so as to meet the urgent requirements of the users for mechanical speed control and energy saving of fan and pumps and improvement of production technologies etc. 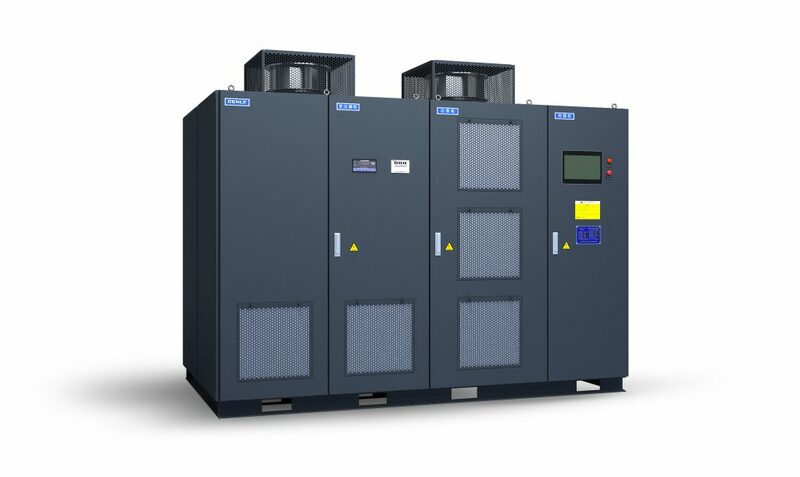 In order to shorten the construction period required for installation and reconstruction of MV VFD system, Renle introduces the integrated design for the drive, which consists of all components and inner wiring of transformer cabinet, power cabinet, control cabinet and MV switchgear (bypass cabinet is optional). The user is only required to connect MV input/output cables, LV control power supply and control signal cables etc. The complete drive has been wholly tested prior to delivery so that both quality and performance of every product is guaranteed. In order to meet the requirement of transformation project and reduce the investment of new project, every function part of RNHV series frequency inverter can be installed step by step. In this way, it is ensured that there is no accident during transporta- tion and installation. Convenient front-back maintenance, high-performance key imported components, and advanced production technologies, all these greatly reduce the requirements of the drive for the site environment.